Observers from continental European countries during the 18th century were amazed – and envious – at the lack of censorship in Britain. There were some laws against too free a use of the printing press, such as the charge of ‘Seditious Libel’ used against Tom Paine’s book,“The Rights of Man”. However, the government of the day generally proved as reluctant to use or enforce them as juries were to convict. British people were proud of their freedom to speak and write their minds – something worth reflecting on in these days of attempts to silence people in the name of political correctness. And if they used that freedom for frivolous purposes as well as serious ones, that was only to be expected. Number 1. (To be-continued the first of every month) of The Rovers Magazine; or, the rambles of men of fashion, and women of pleasure. 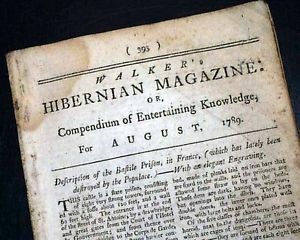 A work wholly devoted to Gaiety, Mirth, Amusement, Love, Gallantry, and the Bon Ton, and Particularly calculated for the perusal of the polite world; as it will exhibit the amours of every class, from the prince to the peasant, from Duchess to the Demireps; and furnish a Manly Banquet of Anecdote, Wit, Humour and Whimsicality which cannot fail to provoke the Laugh, and set the table in a roar; exploring new paths of pleasantry and social bliss; and serving as a new Hobby-Horse; or an agreeable companion in a post-chaise, to help our readers over the Rugged Roads of Life. London: Printed for G. Lister, No. 46, Old Bailey. and sold by the booksellers of Oxford, Cambridge, Bath, York, and all other booksellers and news-carriers in Town and Country. N.B. In the Rovers Magazine will also be introduced – Trials for adultery, crim-con, Rapes, Impotence and Impenetrability. This particular magazine does not appear to have survived even a full year, but there were many others like it.